I will conclude my description of the natural history of these islands, by giving an account of the extreme tameness of the birds. This disposition is common to all the terrestrial species; namely, to the mocking-thrushes, the finches, wrens, tyrant-flycatchers, the dove, and carrion-buzzard. All of them are often approached sufficiently near to be killed with a switch, and sometimes, as I myself tried, with a cap or hat. A gun is here almost superfluous; for with the muzzle I pushed a hawk off the branch of a tree. One day, whilst lying down, a mocking-thrush alighted on the edge of a pitcher, made of the shell of a tortoise, which I held in my hand, and began very quietly to sip the water; it allowed me to lift it from the ground whilst seated on the vessel: I often tried, and very nearly succeeded, in catching these birds by their legs. Formerly the birds appear to have been even tamer than at present. Cowley (in the year 1684) says that the “Turtledoves were so tame, that they would often alight on our hats and arms, so as that we could take them alive; they not fearing man, until such time as some of our company did fire at them, whereby they were rendered more shy.” Dampier also, in the same year, says that a man in a morning’s walk might kill six or seven dozen of these doves. At present, although certainly very tame, they do not alight on people’s arms, nor do they suffer themselves to be killed in such large numbers. It is surprising that they have not become wilder; for these islands during the last hundred and fifty years have been frequently visited by bucaniers and whalers; and the sailors, wandering through the wood in search of tortoises, always take cruel delight in knocking down the little birds. These birds, although now still more persecuted, do not readily become wild. In Charles Island, which had then been colonized about six years, I saw a boy sitting by a well with a switch in his hand, with which he killed the doves and finches as they came to drink. He had already procured a little heap of them for his dinner; and he said that he had constantly been in the habit of waiting by this well for the same purpose. It would appear that the birds of this archipelago, not having as yet learnt that man is a more dangerous animal than the tortoise or the Amblyrhynchus, disregard him, in the same manner as in England shy birds, such as magpies, disregard the cows and horses grazing in our fields. The Falkland Islands offer a second instance of birds with a similar disposition. The extraordinary tameness of the little Opetiorhynchus has been remarked by Pernety, Lesson, and other voyagers. It is not, however, peculiar to that bird: the Polyborus, snipe upland and lowland goose, thrush, bunting, and even some true hawks, are all more or less tame. As the birds are so tame there, where foxes, hawks, and owls occur, we may infer that the absence of all rapacious animals at the Galapagos, is not the cause of their tameness here. The upland geese at the Falklands show, by the precaution they take in building on the islets, that they are aware of their danger from the foxes; but they are not by this rendered wild towards man. This tameness of the birds, especially of the waterfowl, is strongly contrasted with the habits of the same species in Tierra del Fuego, where for ages past they have been persecuted by the wild inhabitants. In the Falklands, the sportsman may sometimes kill more of the upland geese in one day than he can carry home; whereas in Tierra del Fuego it is nearly as difficult to kill one, as it is in England to shoot the common wild goose. In the time of Pernety (1763), all the birds there appear to have been much tamer than at present; he states that the Opetiorhynchus would almost perch on his finger; and that with a wand he killed ten in half an hour. At that period the birds must have been about as tame as they now are at the Galapagos. They appear to have learnt caution more slowly at these latter islands than at the Falklands, where they have had proportionate means of experience; for besides frequent visits from vessels, those islands have been at intervals colonized during the entire period. Even formerly, when all the birds were so tame, it was impossible by Pernety’s account to kill the black-necked swan—a bird of passage, which probably brought with it the wisdom learnt in foreign countries. I may add that, according to Du Bois, all the birds at Bourbon in 1571–72, with the exception of the flamingoes and geese, were so extremely tame, that they could be caught by the hand, or killed in any number with a stick. Again, at Tristan d’Acunha in the Atlantic, Carmichael 1states that the only two land-birds, a thrush and a bunting, were “so tame as to suffer themselves to be caught with a hand-net.” From these several facts we may, I think, conclude, first, that the wildness of birds with regard to man, is a particular instinct directed against him, and not dependent upon any general degree of caution arising from other sources of danger; secondly, that it is not acquired by individual birds in a short time, even when much persecuted; but that in the course of successive generations it becomes hereditary. With domesticated animals we are accustomed to see new mental habits or instincts acquired or rendered hereditary; but with animals in a state of nature, it must always be most difficult to discover instances of acquired hereditary knowledge. In regard to the wildness of birds towards man, there is no way of accounting for it, except as an inherited habit: comparatively few young birds, in any one year, have been injured by man in England, yet almost all, even nestlings, are afraid of him; many individuals, on the other hand, both at the Galapagos and at the Falklands, have been pursued and injured by man, yet have not learned a salutary dread of him. We may infer from these facts, what havoc the introduction of any new beast of prey must cause in a country, before the instincts of the indigenous inhabitants have become adapted to the stranger’s craft or power. Note 1. Linn. Trans., vol. xii. p. 496. The most anomalous fact on this subject which I have met with is the wildness of the small birds in the Arctic parts of North America (as described by Richardson, Fauna Bor., vol. ii. p. 332), where they are said never to be persecuted. This case is the more strange, because it is asserted that some of the same species in their winter-quarters in the United States are tame. There is much, as Dr. Richardson well remarks, utterly inexplicable connected with the different degrees of shyness and care with which birds conceal their nests. How strange it is that the English wood-pigeon, generally so wild a bird, should very frequently rear its young in shrubberies close to houses! OCTOBER 20th.—The survey of the Galapagos Archipelago being concluded, we steered towards Tahiti and commenced our long passage of 3200 miles. In the course of a few days we sailed out of the gloomy and clouded ocean-district which extends during the winter far from the coast of South America. We then enjoyed bright and clear weather, while running pleasantly along at the rate of 150 or 160 miles a day before the steady trade-wind. The temperature in this more central part of the Pacific is higher than near the American shore. The thermometer in the poop cabin, by night and day, ranged between 80 and 83°, which feels very pleasant; but with one degree or two higher, the heat becomes oppressive. We passed through the Low or Dangerous Archipelago, and saw several of those most curious rings of coral land, just rising above the water’s edge, which have been called Lagoon Islands. A long and brilliantly white beach is capped by a margin of green vegetation; and the strip, looking either way, rapidly narrows away in the distance, and sinks beneath the horizon. From the mast-head a wide expanse of smooth water can be seen within the ring. These low hollow coral islands bear no proportion to the vast ocean out of which they abruptly rise; and it seems wonderful, that such weak invaders are not overwhelmed, by the all-powerful and never-tiring waves of that great sea, miscalled the Pacific. November 15th.—At daylight, Tahiti, an island which must for ever remain classical to the voyager in the South Sea, was in view. At a distance the appearance was not attractive. The luxuriant vegetation of the lower part could not yet be seen, and as the clouds rolled past, the wildest and most precipitous peaks showed themselves towards the centre of the island. As soon as we anchored in Matavai Bay, we were surrounded by canoes. This was our Sunday, but the Monday of Tahiti: if the case had been reversed, we should not have received a single visit; for the injunction not to launch a canoe on the Sabbath is rigidly obeyed. After dinner, we landed to enjoy all the delights produced by the first impressions of a new country, and that country the charming Tahiti. A crowd of men, women, and children, was collected on the memorable Point Venus, ready to receive us with laughing, merry faces. They marshalled us towards the house of Mr. Wilson, the missionary of the district, who met us on the road, and gave us a very friendly reception. After sitting a very short time in his house, we separated to walk about, but returned there in the evening. The land capable of cultivation, is scarcely in any part more than a fringe of low alluvial soil, accumulated round the base of the mountains, and protected from the waves of the sea by a coral reef, which encircles the entire line of coast. Within the reef there is an expanse of smooth water, like that of a lake, where the canoes of the natives can ply with safety and where ships anchor. The low land which comes down to the beach of coral-sand, is covered by the most beautiful productions of the intertropical regions. In the midst of bananas, orange, cocoa-nut, and bread-fruit trees, spots are cleared where yams, sweet potatoes, and sugar-cane, and pine-apples are cultivated. Even the brush-wood is an imported fruit-tree, namely, the guava, which from its abundance has become as noxious as a weed. In Brazil I have often admired the varied beauty of the bananas, palms, and orange-trees contrasted together; and here we also have the bread-fruit, conspicuous from its large, glossy, and deeply digitated leaf. It is admirable to behold groves of a tree, sending forth its branches with the vigour of an English oak, loaded with large and most nutritious fruit. However seldom the usefulness of an object can account for the pleasure of beholding it, in the case of these beautiful woods, the knowledge of their high productiveness no doubt enters largely into the feeling of admiration. The little winding paths, cool from the surrounding shade, led to the scattered houses; the owners of which everywhere gave us a cheerful and most hospitable reception. I was pleased with nothing so much as with the inhabitants. There is a mildness in the expression of their countenances which at once banishes the idea of a savage; and an intelligence which shows that they are advancing in civilization. The common people, when working, keep the upper part of their bodies quite naked; and it is then that the Tahitians are seen to advantage. They are very tall, broad-shouldered, athletic, and well-proportioned. It has been remarked, that it requires little habit to make a dark skin more pleasing and natural to the eye of an European than his own colour. A white man bathing by the side of a Tahitian, was like a plant bleached by the gardener’s art compared with a fine dark green one growing vigorously in the open fields. Most of the men are tattooed, and the ornaments follow the curvature of the body so gracefully, that they have a very elegant effect. One common pattern, varying in its details, is somewhat like the crown of a palm-tree. It springs from the central line of the back, and gracefully curls round both sides. The simile may be a fanciful one, but I thought the body of a man thus ornamented was like the trunk of a noble tree embraced by a delicate creeper. Many of the elder people had their feet covered with small figures, so placed as to resemble a sock. This fashion, however, is partly gone by, and has been succeeded by others. Here, although fashion is far from immutable, every one must abide by that prevailing in his youth. An old man has thus his age for ever stamped on his body, and he cannot assume the airs of a young dandy. The women are tattooed in the same manner as the men, and very commonly on their fingers. One unbecoming fashion is now almost universal: namely, shaving the hair from the upper part of the head, in a circular form, so as to leave only an outer ring. The missionaries have tried to persuade the people to change this habit; but it is the fashion, and that is a sufficient answer at Tahiti, as well as at Paris. I was much disappointed in the personal appearance of the women: they are far inferior in every respect to the men. The custom of wearing a white or scarlet flower in the back of the head, or through a small hole in each ear, is pretty. A crown of woven cocoa-nut leaves is also worn as a shade for the eyes. The women appear to be in greater want of some becoming costume even than the men. Nearly all the natives understand a little English—that is, they know the names of common things; and by the aid of this, together with signs, a lame sort of conversation could be carried on. In returning in the evening to the boat, we stopped to witness a very pretty scene. Numbers of children were playing on the beach, and had lighted bonfires which illumined the placid sea and surrounding trees; others, in circles, were singing Tahitian verses. We seated ourselves on the sand, and joined their party. The songs were impromptu, and I believe related to our arrival: one little girl sang a line, which the rest took up in parts, forming a very pretty chorus. The whole scene made us unequivocally aware that we were seated on the shores of an island in the far-famed South Sea. 17th.—This day is reckoned in the log-book as Tuesday the 17th, instead of Monday the 16th, owing to our, so far, successful chase of the sun. Before breakfast the ship was hemmed in by a flotilla of canoes; and when the natives were allowed to come on board, I suppose there could not have been less than two hundred. It was the opinion of every one that it would have been difficult to have picked out an equal number from any other nation, who would have given so little trouble. Everybody brought something for sale: shells were the main articles of trade. The Tahitians now fully understand the value of money, and prefer it to old clothes or other articles. The various coins, however, of English and Spanish denomination puzzle them, and they never seemed to think the small silver quite secure until changed into dollars. Some of the chiefs have accumulated considerable sums of money. One chief, not long since, offered 800 dollars (about 160l. sterling) for a small vessel; and frequently they purchase whale-boats and horses at the rate of from 50 to 100 dollars. After breakfast I went on shore, and ascended the nearest slope to a height of between two and three thousand feet. The outer mountains are smooth and conical, but steep; and the old volcanic rocks, of which they are formed, have been cut through by many profound ravines, diverging from the central broken parts of the island to the coast. Having crossed the narrow low girt of inhabited and fertile land, I followed a smooth steep ridge between two of the deep ravines. The vegetation was singular, consisting almost exclusively of small dwarf ferns, mingled higher up, with coarse grass; it was not very dissimilar from that on some of the Welsh hills, and this so close above the orchard of tropical plants on the coast was very surprising. At the highest point, which I reached, trees again appeared. Of the three zones of comparative luxuriance, the lower one owes its moisture, and therefore fertility, to its flatness; for, being scarcely raised above the level of the sea, the water from the higher land drains away slowly. The intermediate zone does not, like the upper one, reach into a damp and cloudy atmosphere, and therefore remains sterile. The woods in the upper zone are very pretty, tree-ferns replacing the cocoa-nuts on the coast. It must not, however, be supposed that these woods at all equal in splendour the forests of Brazil. The vast numbers of productions, which characterize a continent, cannot be expected to occur in an island. From the highest point which I attained, there was a good view of the distant island of Eimeo, dependent on the same sovereign with Tahiti. On the lofty and broken pinnacles, white massive clouds were piled up, which formed an island in the blue sky, as Eimeo itself did in the blue ocean. The island, with the exception of one small gateway, is completely encircled by a reef. At this distance, a narrow but well-defined brilliantly white line was alone visible, where the waves first encountered the wall of coral. The mountains rose abruptly out of the glassy expanse of the lagoon, included within this narrow white line, outside which the heaving waters of the ocean were dark-coloured. The view was striking: it may aptly be compared to a framed engraving, where the frame represents the breakers, the marginal paper the smooth lagoon, and the drawing the island itself. When in the evening I descended from the mountain, a man, whom I had pleased with a trifling gift, met me, bringing with him hot roasted bananas, a pine-apple, and cocoa-nuts. After walking under a burning sun, I do not know anything more delicious than the milk of a young cocoa-nut. Pine-apples are here so abundant that the people eat them in the same wasteful manner as we might turnips. They are of an excellent flavor-perhaps even better than those cultivated in England; and this I believe is the highest compliment which can be paid to any fruit. 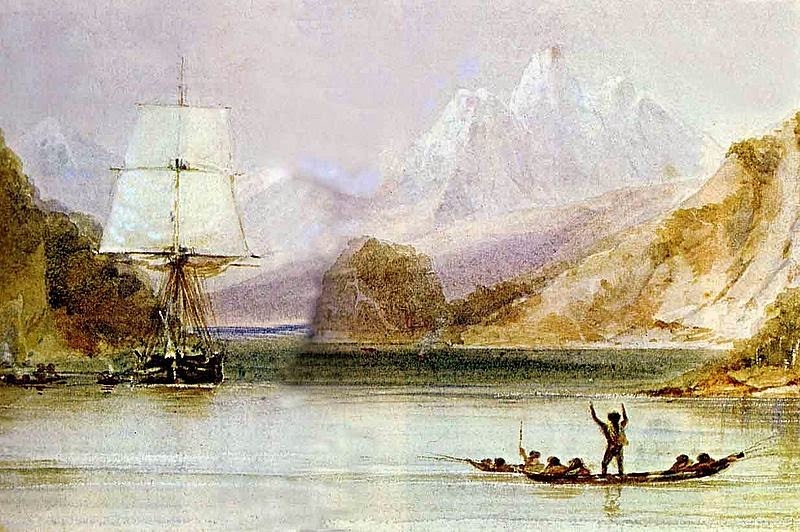 Before going on board, Mr. Wilson interpreted for me to the Tahitian who had paid me so adroit an attention, that I wanted him and another man to accompany me on a short excursion into the mountains. 18th.—In the morning I came on shore early, bringing with me some provisions in a bag, and two blankets for myself and servant. These were lashed to each end of a long pole, which was alternately carried by my Tahitian companions on their shoulders. These men are accustomed thus to carry, for a whole day, as much as fifty pounds at each end of their poles. I told my guides to provide themselves with food and clothing; but they said that there was plenty of food in the mountains, and for clothing, that their skins were sufficient. Our line of march was the valley of Tia-auru, down which a river flows into the sea by Point Venus. This is one of the principal streams in the island, and its source lies at the base of the loftiest central pinnacles, which rise to a height of about 7000 feet. The whole island is so mountainous that the only way to penetrate into the interior is to follow up the valleys. Our road, at first, lay through woods which bordered each side of the river; and the glimpses of the lofty central peaks, seen as through an avenue, with here and there a waving cocoa-nut tree on one side, were extremely picturesque. The valley soon began to narrow, and the sides to grow lofty and more precipitous. After having walked between three and four hours, we found the width of the ravine scarcely exceeded that of the bed of the stream. On each hand the walls were nearly vertical; yet from the soft nature of the volcanic strata, trees and a rank vegetation sprung from every projecting ledge. These precipices must have been some thousand feet high; and the whole formed a mountain gorge far more magnificent than anything which I had ever before beheld. Until the midday sun stood vertically over the ravine, the air felt cool and damp, but now it became very sultry. Shaded by a ledge of rock, beneath a façade of columnar lava, we ate our dinner. My guides had already procured a dish of small fish and fresh-water prawns. They carried with them a small net stretched on a hoop; and where the water was deep and in eddies, they dived, and like otters, with their eyes open followed the fish into holes and corners, and thus caught them. The Tahitians have the dexterity of amphibious animals in the water. An anecdote mentioned by Ellis shows how much they feel at home in this element. When a horse was landing for Pomarre in 1817, the slings broke, and it fell into the water; immediately the natives jumped overboard, and by their cries and vain efforts at assistance almost drowned it. As soon, however, as it reached the shore, the whole population took to flight, and tried to hide themselves from the man-carrying pig, as they christened the horse. A little higher up, the river divided itself into three little streams. The two northern ones were impracticable, owing to a succession of waterfalls which descended from the jagged summit of the highest mountain; the other to all appearance was equally inaccessible, but we managed to ascend it by a most extraordinary road. The sides of the valley were here nearly precipitous; but, as frequently happens with stratified rocks, small ledges projected, which were thickly covered by wild bananas, lilaceous plants, and other luxuriant productions of the tropics. The Tahitians, by climbing amongst these ledges, searching for fruit, had discovered a track by which the whole precipice could be scaled. The first ascent from the valley was very dangerous; for it was necessary to pass a steeply inclined face of naked rock, by the aid of ropes which we brought with us. How any person discovered that this formidable spot was the only point where the side of the mountain was practicable, I cannot imagine. We then cautiously walked along one of the ledges till we came to one of the three streams. This ledge formed a flat spot, above which a beautiful cascade, some hundred feet in height, poured down its waters, and beneath, another high cascade fell into the main stream in the valley below. From this cool and shady recess we made a circuit to avoid the overhanging waterfall. As before, we followed little projecting ledges, the danger being partly concealed by the thickness of the vegetation. In passing from one of the ledges to another, there was a vertical wall of rock. One of the Tahitians, a fine active man, placed the trunk of a tree against this, climbed up it, and then by the aid of crevices reached the summit. He fixed the ropes to a projecting point, and lowered them for our dog and luggage, and then we clambered up ourselves. Beneath the ledge on which the dead tree was placed, the precipice must have been five or six hundred feet deep; and if the abyss had not been partly concealed by the overhanging ferns and lilies my head would have turned giddy, and nothing should have induced me to have attempted it. We continued to ascend, sometimes along ledges, and sometimes along knife-edged ridges, having on each hand profound ravines. In the Cordillera I have seen mountains on a far grander scale, but for abruptness, nothing at all comparable with this. In the evening we reached a flat little spot on the banks of the same stream, which we had continued to follow, and which descends in a chain of waterfalls: here we bivouacked for the night. On each side of the ravine there were great beds of the mountain-banana, covered with ripe fruit. Many of these plants were from twenty to twenty-five feet high, and from three to four in circumference. By the aid of strips of bark for rope, the stems of bamboos for rafters, and the large leaf of the banana for a thatch, the Tahitians in a few minutes built us an excellent house; and with withered leaves made a soft bed.